Recent developments in case law along with the effect of the depressed economy on family law make this a good time to visit the current law of contempt remedies. We will start with a refresher on the law of contempt, and then discuss new developments and their anticipated impact on the practice of family law. There are three different types of contempt actions. The least common is criminal contempt, punishable under Wis. Stats. §940.48(2). Such an action requires that the district attorney issue a criminal complaint, with the defendant accorded the full panoply of constitutional rights. Given the disinclination of district attorneys to intervene in civil cases and the other contempt remedies available, there are few criminal complaints issued under this statute in family law. Summary contempt 1 is the most common variety in popular culture, although not so much in real life. On television lawyer shows, judges frequently threaten to find misbehaving lawyers and parties in contempt. This form of contempt can be used only sparingly, as it bypasses due process rights, not the least of which is right to a trial by jury. In order to constitutionally pass muster, the contemptuous act must have been committed within the presence of the trial court. The best example of the difference between criminal contempt and summary contempt can be seen in State v. Lemmons, 148 Wis. 2d 740, 437 N.W.2d 224. In that case, Janet Lemmons was a spectator at her husband’s jury trial. She was found in contempt by the trial court for two instances of inappropriate comments to the district attorney and witnesses, in direct violation of an order to not have any contact with the witnesses. One instance occurred in the courtroom, the other in the corridor outside the courtroom. On appeal, the former finding of contempt was affirmed as it occurred within the presence of the trial court. The latter contempt finding was reversed as the trial court did not personally witness the contemptuous act. Essentially, in a summary contempt the trial court is not only the finder of fact and law, but also an actual witness to the occurrence. The due process shortcuts are permitted because the court personally witnessed the events. (b) the alleged contemnor did not comply. These steps are usually rather simple: A support order plus proof of an arrearage is sufficient in most cases. The burden then shifts to the alleged contemnor, who has the opportunity to prove an inability to comply with the order. 3 If the court finds that the alleged contemnor did not have the ability to comply with the order, the court cannot find contempt. When the economy was strong and jobs plentiful, it was difficult for a payor to avoid a contempt finding if the only excuse was an inability to find work. Times have changed, of course, and failure to find work may very well be a viable defense today. Frequently where the court finds an inability to comply, there will be a corresponding motion to modify support, which may very well be granted. However, the modification can only affect payments due after the filing of the motion to modify. Where the payments are pursuant to Section 71 or otherwise not modifiable, a failure to find contempt based upon inability to pay does not forgive the payments, but it does make collection difficult if not impossible. Usually, the court will order that the payor can avoid contempt if he or she pays a certain amount, even if less than the ordered payment. The non-modifiable order remains in effect, with the payee (and the payor) hoping that circumstances change in the future. If contempt is found, incarceration cannot be immediately ordered – we don’t have debtor’s prison. The court must give the “defendant” an opportunity to purge the contempt. 5 The purge order requirements must be within the contemnor’s ability. So, in the instance where some payment could be made but not the full amount, the court can find contempt, but the purge order will be based on ability to pay. If the contempt has not been purged and the court finds that the contemnor had the ability to do so, the incarceration can continue only until the contemnor has complied with the purge order or six months, whichever comes first. The contemnor must have the “keys to the jail cell” available as the sentence is not for punishment, but only to secure compliance with the court order. In Frisch v. Henrichs, 2007 WI 102, 304 Wis.2d 1, 736 N.W. 2d 85, the payor was found in contempt for failing to provide his ex-wife with tax and income information. The trial court found that the contempt was continuing at the time of the hearing within the meanng of Wis. State. §767.27(2m). 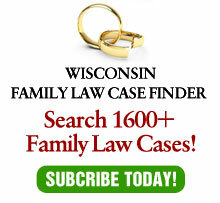 The Wisconsin Supreme Court affirmed, rejecting the payor’s argument that he did not need to supply that information because he and his ex-wife has stipulated to freeze child support for a specified period of time, consistent with then existing law. The high court, however, held that this stipulation was unenforceable because it was not in the best interests of the children and contrary to public policy. Therefore, the court found a “continuing contempt” for failing to provide the financial information. More recently, in Christensen v. Sullivan, 2009 WI 87, 320 Wis. 2d 76, 768 N.W. 2d 798, the supreme court considered whether the circuit court was required to order monetary damages for certain members of a class who were inmates at the Milwaukee County Jail as a remedial sanction against Milwaukee County for its repeated violations of a consent decree, when there was no dispute that the violations had ceased by the time the contempt proceeding was filed. Citing Frisch, the court found that remedial sanctions may be imposed for the purpose of terminating a continuing contempt of court, while criminal contempt could be imposed to punish a past contempt of court. The supreme court held, therefore, that the county could not be found in remedial contempt, because breaches of the consent decree had ceased before the action for contempt was filed. As discussed above, the distinction between remedial and criminal contempt is significant. Under the former, a pro se litigant can seek to enforce court orders regarding support and placement and have incarceration available as a sanction for failing to purge a contempt finding. Criminal contempt, however, would require the intervention of the district attorney, which is highly unlikely in family law cases. There are several unresolved issues after Christenson. The most prominent is whether the court has authority to entertain a remedial contempt action where the underlying act is not continuing or has been remedied, but there are remaining ramifications arising from that act. A typical example is a support payor who misses a payment, but has paid the arrearage by the time brings of the contempt hearing. In such a case, the underlying violation has been remedied, but the costs of bringing the contempt action, usually attorney fees, have not. Is the failure to remedy all of the ramifications of a violation of a court order a “continuing contempt” under Frisch or a “dead” one under Christenson? Similarly, is a one-time failure to afford placement a “continuing contempt?” If the alleged violator does not allow placement on only one occasion, would remedial contempt be barred as seeking punishment for a past misdeed? Finally, the court in Christenson held that remedial contempt was not available because the violations had ceased by the time the contempt action was filed. Is the operative time for cessation of the contempt when the action is filed? What would happen if the contempt stopped after the action was filed but before it was heard by the court? Would there still be a continuing contempt? It is a regrettable that the supreme court failed to provide guidance for these circumstances, since few litigants have the resources to fund an appeal to answer these questions. Still, it only makes sense that all ramifications of a failure to abide by a court order should be remedied before a court loses the ability to right the wrong. Otherwise, there would be an opportunity for support payors to miss a payment, let the recipient expend the costs of filing contempt action, and then abate the process by doing what should have been done in the first place. Similar opportunities for manipulation can easily be envisioned for placement cases, where a miscreant could ignore a court order, but avoid sanctions by proposing makeup time in the future, while the innocent parties may have expended costs in the interim. As seen earlier, remedial contempt is the only practical option in most family law scenarios. While the issue is troublesome, it is hoped that trial courts will interpret Frisch and Christensen consistent with common sense – that remedial contempt sanctions are available until all harm caused by the failure to obey a court order, including any costs incurred to secure compliance, has been remedied. 4- Payor cannot be found in contempt where his loss of income was out of his control. Krieman v. Goldberg, 214 Wis. 2d 163, 571 N.W.2d 425 (Ct. App. 1997). 5- In re Paternity of C.J., 196 Wis.2d 964, 539 N.W.2d 703 (Ct. App. 1995). 6- Meyer v. Teasdale, 2009 WI 152, 321 Wis. 2d 633, 775 N.W.2d 123. 8- State ex rel. V.J.H. v. C.A.B., 163 Wis. 2d 833, 472 N.W.2d 839 (Ct. App. 1991).